Muito bonita! Tamara Sheward checks into a Rio hostel in Brazil that makes her want to sing The Girl From Ipanema. It’s the one and only Bonita Ipanema. “Earworm” is taken from a German word (Ohrwurm: music stuck in one’s head), but it’s in Brazil — Rio, especially — where it burrows the deepest. Peter Allen’s jazz-handy ‘I Go To Rio’ and Duran Duran’s ‘Rio’ are sticky enough, but it’s the tuneful resin of ‘The Girl From Ipanema’ that had me clawing at my scalp from the moment I touched down in the Cidade Maravilhosa. They reckon the best way to get a song off mental repeat is to return to the bloody thing itself. But why not go one better and head straight to the source? 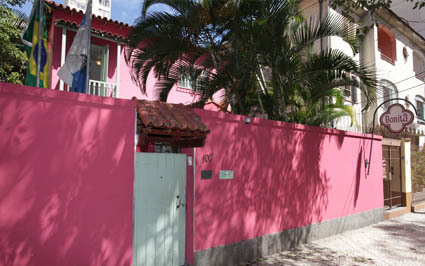 107 Rua Barão de Torre, Ipanema, is the former home of Antonio Carlos Jobim, the composer responsible for the song’s addictive bossa nova sway. It was here the bespectacled cigar aficionado would repair to after engaging in the finest Carioca tradition — girl-watching — to plink out the now-famous melody on a piano. Today the cigar smoke has cleared and the walls are painted a most un-Jobim shade of hot pink, but what remains is well on its way to becoming a legend itself. Bonita Ipanema — named, aptly, after another Jobim ditty — isn’t your typical tropical hostel. Sure, the poolside hammocks entice sunburnt snoozers and the requisite bar echoes with beer-drenched tall tales. But like its former tenant, Bonita’s got class. Spotless, airy and sporting an in-office boutique (just try resisting the lure of their gorgeous, locally-made handmade totes), Bonita welcomes the solo and discerning traveller with an inclusive hospitality unimaginable at the backpacker factories down the Rua. Their slogan is “Close to everything, but you just might want to stay in”, and with chilled-out nooks and bar manager Patricia’s homemade caipirinhas, you probably will. Cut and discard the ends off a lime. Cut lime in half, removing the pith, then quarter. Toss these and a couple tablespoons of sugar (to taste) in a shaker and muddle the mix. Add lashings of ice and cover entirely with Cachaça (Brazilian national spirit). Shake the bejesus out of it. Pour and enjoy to your favourite tune.